Response: After you succeed at a story, discard a card at random from each opponent's hand. Then, you may pay 1 to return Endless Interrogation to your hand instead of discarding it. Is this card still Banned? I have the expansion it came in and have been curious about trying it in my Agency/Hastur deck. Yep, as if you had all 3 domains undrained, after succeeding at a story, you could make your opponent discard 4 cards at random, and there is little they can do. I've never tried it either, but I can imagine why that would make it so beastly. This would be the stupidest card in the game if was unbanned. If your second player on your opponents turn you play eldric nexus or however it is spelled gain a domain (maybe two with another or another way) and on your turn after succeed discard three cards of your opponents on your first turn....many decks couldn't come back from that. very true but I have to say this is the type (cross faction steadfast) of card we should be getting in a future Deluxe. It is cross faction, but due to being cost 0, all you need is a single Hastur resource and 0 Agency in the deck besides itself. After rereading and thinking about it I can see why this could be silly. I wouldn't suppose anyone knows of or has a list of all the current banned/restricted cards? FAQ 4.0 - Unbanned, now restricted. Should read: “Response: After you succeed at a story, discard a card at random from each opponent’s hand. 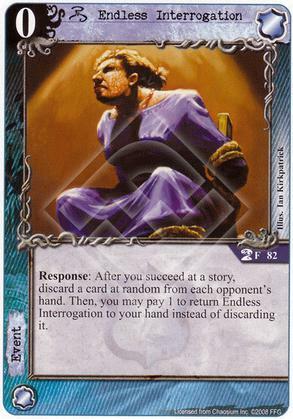 Then, you may pay 1 to return Endless Interrogation to the top of your deck instead of discarding it. sooooooo worth playing with its new version and taking restricted spot?